With the Hitman games gradually moving away from the established norms of the earlier entries in the series, it can be understandably tempting to view change as a negative factor. In the case of Hitman GO however, the alterations wrought by the developer are wholesale and at first, more than a little jarring to long-time fans of the IO Interactive developed games. Hitman GO trades the series creatively murderous playgrounds for a turn-based affair and uniquely attractive board game aesthetic. In spite of this though, Hitman GO still manages to incorporate enough hallmarks of the franchise that long-time fans shouldn’t feel alienated. It’s the sort of seismic genre-leap from action adventure to turn-based puzzler that shouldn’t really work at all and yet it does work and manages to do so beautifully. In short, Hitman GO is a franchise mobile spin-off done right. 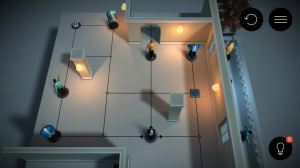 Ascribing to a mostly top-down, but adjustable perspective, Hitman GO tasks the player with assassinating one or more targets at the end of every themed board game section. With each section made up of individually compact, yet challenging levels, Hitman GO starts folks off gently with each consecutive level introducing a new element to the game. As mentioned before, Hitman GO is a turn-based game with a tabletop slant and it’s the former which dictates how players are able to move Agent 47 around the board. Each turn you see, allows the barcoded butcher to move one space in a direction dictated by preset lines on the board. The thing is, with every stride that Agent 47 takes, so too do other opposing pieces on the board make their move and thus notions of planning and understanding enemy movement patterns start to creep in as absolute requisites to proceed. Failure can come swiftly in Hitman GO, too. Should an enemy piece get within one space of our suave slaughterer, Agent 47’s figure is knocked over and the level is over. Assuredly though, retries are instant and as a result there exists no artificial barrier preventing players from getting stuck straight back into the thick of it on a particularly troublesome level. 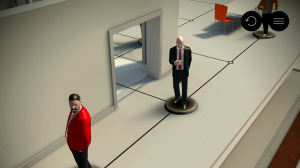 Whereas in previous Hitman games players were afforded a degree of leniency when it came to all-out confrontation, Hitman GO is steadfastly stingy when it comes to such luxury and instead forces folks to use stealth as the sole means to dispose of their enemies. This can be achieved by either moving into the same space as an enemy piece from behind, or, moving into the same space as a foe who will be turning their back on Agent 47 in their next turn. Where things get more difficult, is that these foes come in markedly different flavours. You have stationary enemies who remain fixed on a particular vantage point, mobile enemies that roam the board, enemies with knives and much more besides to contend with in the later stages. Hallmarks of Hitman’s heritage are also generously tapped into in order to provide further wrinkles to the game’s formula, too. Stones can be thrown to distract enemies (allowing Agent 47 to knock off a group in a single move if planned correctly), trapdoors can be entered and allow Agent 47 to emerge from different points on the board, while disguises allow our protagonist to sneak by wandering enemies without any harassment. It’s these sorts of elements that serve as a keen and pleasant reminder that this just isn’t any puzzle-stuffed board game, this is a Hitman themed puzzle-stuffed board game and the introduction of such gameplay mechanisms infer a closer to kinship to IO Interactive’s titles than the game’s radically different appearance might otherwise suggest. Certainly, Hitman’s chief maxim has been patience and in Hitman GO, nothing has changed since it still remains as a pre-requisite for success throughout. When all of the aforementioned enemy types are combined with these elements from previous Hitman games alongside some truly sly and ingenious map layouts, Hitman GO becomes challenging quickly, but never abruptly so owing to the well-judged learning curve that the game deftly encompasses. As its mobile design DNA befits, Hitman GO is an easily accessible affair capable of providing digestible bite-seized portions of gameplay and each level can be retried instantly at any point without any hassle. In further subscribing to its mobile trappings and providing a welcome additional dose of longevity in the process, every level is scored by a three star system with a perfect score only achievable when all the objectives have been dutifully fulfilled. Such objectives range from killing all enemies on a given map, to killing no enemies at all to collecting a briefcase, which when taken in tandem with all the other challenges that each level presents, can be quite an arduous, yet fulfilling task to complete. If Hitman GO has one main flaw, it’s that despite its nifty bag of tricks and compelling puzzle gameplay, the game can start to feel a little repetitive over extended play. Also, Hitman junkies who go into the game expecting slo-mo face shooting, ‘Focus Vision’ funkery and brutal garrotings, might be a little put off by the game’s visually pacifist and low-key take on what is otherwise an incredibly violent franchise. Therein lies the game’s charm though, players who don’t play or even remotely enjoy the core Hitman games can find a great deal of enjoyment in Hitman GO’s craftily constructed conundrums, whereas stalwart Hitman veterans can, with the appropriate expectation and digging beneath the surface, find enough of their beloved franchise present in this mobile offering to be worthwhile. An Android copy of Hitman GO was independently purchased by the reviewer for use on a Google Nexus 7 (2012) tablet. Hitman GO is available on iPhone and iPad here. Hitman GO is also available on Android phones and tablets here.